but seing as stairs are mostly used to just jump over and in themselves have no function other than as an obstacle it wouldnt realy matter what was there. Well yeah. But some people seem to prefer hurling themselves down steps don't they? i thinks stairs are always an awkward part of skatparks.. to be honest, yeah a flatbank serves the same purpose, but its just never the same. unless theres a rail/hubba goin down the stairs, theyre pretty much pointless. 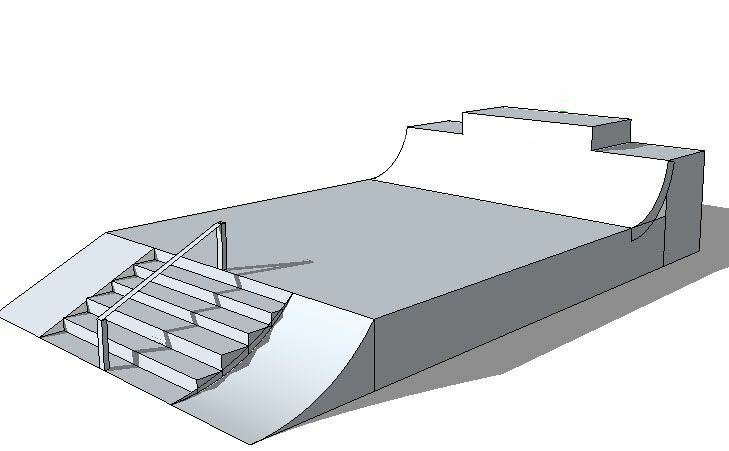 unless our budget is as large as we hope, and the space we have is big enough i think we should consider goin for flatbanks rather than stairs with them being such a flow killer. 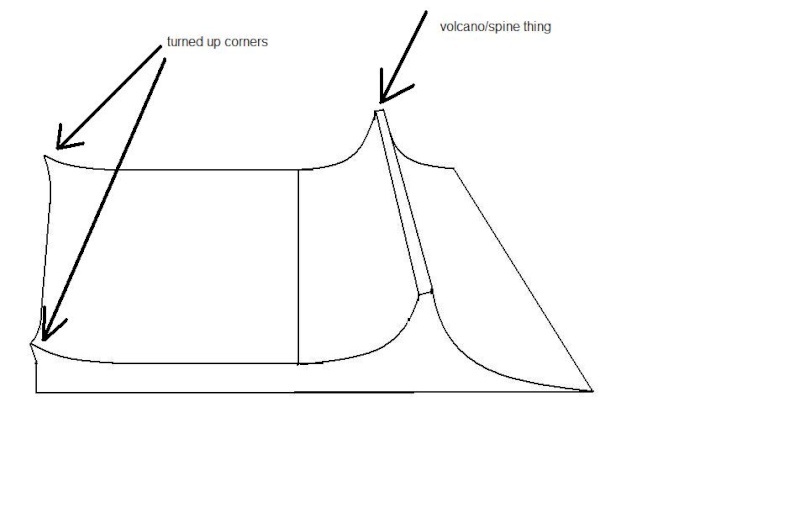 unless stairs are something the majority really want, i think we shouldnt really bother..
acts as a straight manny/grinding pad on one side and a fun micro quarter on the other. or you could just hop on the pad, and slide into the quarter cos you're that gnarly. nay bad.. the spine is kinda pointless like that though as youll just run straight into the block the other side. what rob has going on is a winner though... i could skate that for hours. as for fun boxes/hubbas, a bit standard to be honest. 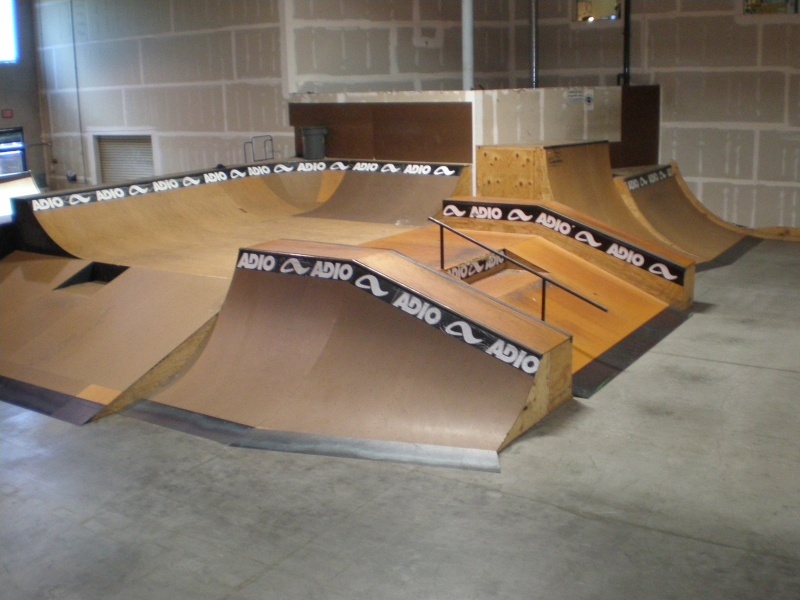 fact is were gunnu have the chance to build with some of the best developers of skateparks in the country. we should really test them with designs rather than using a standard funbox with rail and hubba format.. get something really different going on. been away all weekend, but gunnu try knock out some ideas this afternoon.. looking good so far though peeps. i think womble (?) has got a bit mixed up. the block is only like 25cm high and the micro quarter is like 35cm tall. its not a huge platform or anything. trying to find some footage of the one at mudchute. yeah your probably right about the spine bein useless. art attack time! 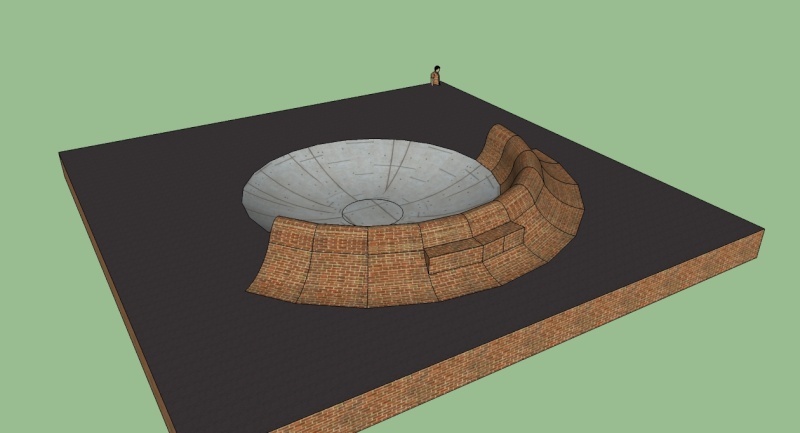 knocked up a few designs involving stairs in googlesketchup. 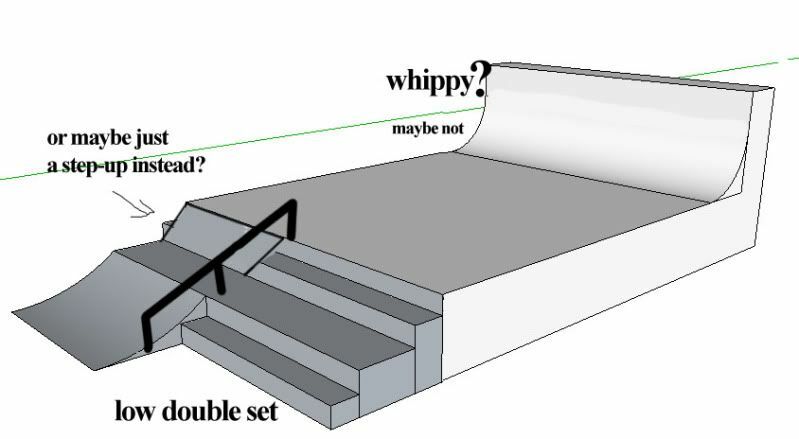 thinking of ways to increase the flow around steps in parks. i reckon the first design is a lot more compateble and more flow than the other. 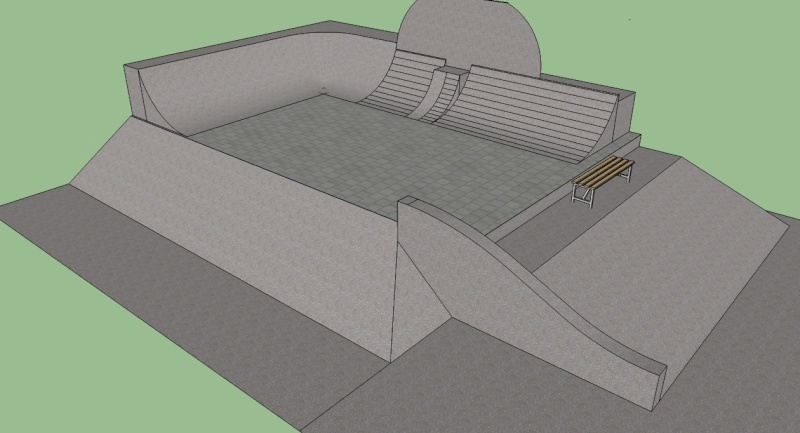 plus both goofs and reggs skaters can hit up the rail cos it's in the middle but then again its narrower for doing tricks over the stairs. but having a step up/bank up would be sick. thats sick rob. would defo have to be transistion. mellow like and decent height on the block for stalls/mannys. keep em coming rob! yeah, you'd want a very mellow transition for that thing. i don't know about the scale though. the pad on top should be about 3ish metres across so it doesnt soak up loads of room in the park. i recently came back from falmouth, went to the Truro skate plaza. it was a beast, really good. only ting was, in certain spots you got people hangin out, not skatin and it kinda got in the way. suggestion be benches round the outside, Truro didnt have any. they need not be a seating area cos if you could dot em about then they could end up being another feature when no one be sittin on em. dot a few around the perimeter could work in a a couple at the top of a flat bank or something? dont have any beef with folks hangin around but if you've got a limited amount of time in the day its a ballache to keep asking people, however politely, "could you scootch over a wee bit please?" 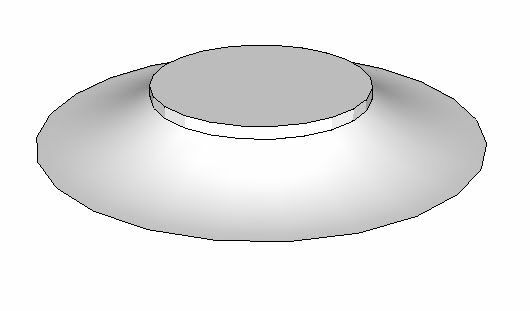 its just a quick drawing...its dificult to get angles and dimensions perfect. im sure theres a way to make it rideable for everyone. Greetz everyone... this is Nick (Young peoples worker that ya see around Euxton & at the skatepark meets). Just a quick link to say.. well played.... you represent yerselves really well at the meets & some of yer ideas/designs are just wicked. Keep up the momentum.... C ya at next meet if not sooner.